Located in Can Cartro, Cal Catasús is a 5-minute drive from Can Bas and 6 minutes from Castellroig Wines and Sparkling Wines. When you stay at Apartamentos Cal Mosqueta in Guixers, you'll be 10 minutes by car from Font de la Puda. With a stay at Casa Miralrio in Milagro, you'll be within a 15-minute drive of Convent of the Carmelitas and Parish Church of Santa Eufemia. Located in Sallent de Gallego, Apartamentos Sallent 3000 is within a 10-minute drive of Furco Chair Lift and Cinta Sextas. With a stay at Casa del Castillo in Siguenza, you'll be just steps from Siguenza Castle and San Vicente Church. The front desk is staffed during limited hours. 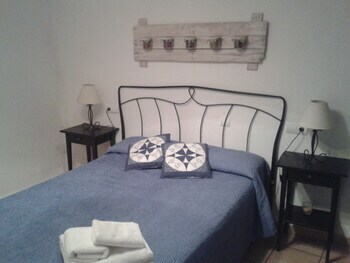 When you stay at this apartment in Torrevieja, you'll be near the beach and 3 minutes by foot from Punta Prima Beach. Free self parking is available onsite. A stay at Calella Park La Esquina Verde places you in the heart of Calella, steps from Calella Beach and 8 minutes by foot from Pineda de Mar Beach. With a stay at this apartment, you'll be centrally located in Madrid, within a 10-minute drive of Prado Museum and El Retiro Park.